Today's date is a good time to do more research about baby ear infections and prevent chronic ear infections occurrence. Ear infections are by far the most common medical condition occurring in babies and young children. Most often, the infection affects the middle ear. Tubes inside the ears become clogged with fluid and mucus. This can affect hearing, because sound cannot get through all that fluid. 3 out of every 4 kids will get one or more ear infections by their 3rd birthday. In fact, ear infections are the most common reason parents bring their children to a doctor. Typically, baby ear infections go away on their own, but your doctor may recommend pain relievers. Chronic ear infections in young children and babies may require anti-biotics. Children who get frequent or "chronic ear infections" may need minor surgery to place small tubes in their ears. The tubes relieve ear pressure so the child can hear well. There are three main kinds of ear infections, which are called acute otitis media, otitis media with effusion, and otitis externa (Swimmer's Ear). Sometimes ear infection can be painful and may even need anti-biotics treatment. Your doctor will be able to determine what kind of ear infection your child has and if antibiotics may help the ear-infection. Ear infections are an all to common issue with children of all ages. The type of ear infection that is usually painful and may improve with antibiotic treatment is called acute otitis media, or AOM. Symptoms of AOM include pain, redness of the eardrum, pus in the ear, and fever. Children may pull on the affected ear, and infants or toddlers may be irritable. Antibiotics are often prescribed to children for AOM, but are not always necessary. Otitis media with effusion or OME, is a build up of fluid in the middle ear without signs and symptoms of acute infection (pain, redness of the eardrum, pus, and fever). OME is more common than AOM, and may be caused by viral upper respiratory infections, allergies, or exposure to irritants (i.e. cigarette smoke). The build up of middle ear flid does not usually cause pain and almost always goes away on its own. OME will not usually benefit from antibiotic treatment. Type 3 - "Swimmer's Ear"
Swimmer's Ear is a commonly occurring ear-infection of the ear or its outer ear canal. It can cause the ear to itch or become red and swollen so touching the ear or pressure on the ear is very painful. There may also be pus that drains from the ear. Antibiotics are often needed to treat swimmers-ear: a.k.a. otitis externa. We have more information about symptoms, treatment, causes, and prevention of Swimmer's Ear. An ear infection usually is caused by bacteria and often begins after a child has a sore throat, cold, or other upper respiratory infection. If the upper respiratory infection is bacterial, these same bacteria may spread to the middle ear; if the upper respiratory infection is caused by a virus, such as a cold, bacteria may be drawn to the microbe-friendly environment and move to middle ear as a secondary infection. Dur to the ear-infection, fluid builds up behind the eardrum. The ear has three major parts: the outer ear, middle ear and inner ear. The outer ear, also called the pinna, includes everything we see on the outside the curved flap of the ear leading down to the earlobe but it also includes the ear canal, which begins at the opening to the ear and extends to the eardrum. The eardrum is a membrane that separates the outer ear from the middle ear. 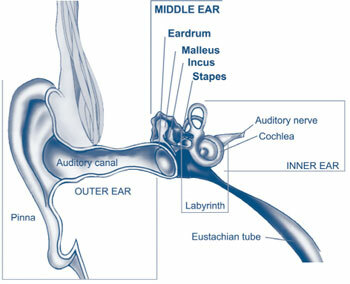 The middle ear which is where ear infections occur is located between the eardrum and the inner ear. Within the middle ear are three tiny bones called the malleus, incus, and stapes that transmit sound vibrations from the eardrum to the inner ear. The bones of the middle ear are surrounded by air. Why are children much more likely vs adults to get ear infections? There are several reasons why children are more likely than adults to get ear infections. Click-here for Health Tip-of-the-Day. A child's immune system isn't as effective as an adult's because it's still developing. This makes it harder for children to fight infections. Your doctor can determine what kind of ear infection is present and if treatment is needed. If your child is younger than three months of age and has a fever, it's important to always call your doctor right away. How Does Doctor Diagnose a Middle Ear Infection? The first thing a doctor will do is ask you about your child's health. Has your child had a head cold or sore throat recently? Is he having trouble sleeping? Is she pulling at her ears? If an ear infection seems likely, the simplest way for a doctor to tell is to use a lighted instrument, called an otoscope, to look at the eardrum. A red, bulging eardrum indicates an infection. Tympanometry, which uses sound tones and air pressure, is a diagnostic test a doctor might use if the diagnosis still isn't clear. A tympanometer is a small, soft plug that contains a tiny microphone and speaker as well as a device that varies air pressure in the ear. It measures how flexible the eardrum is at different pressures. Antibiotics are Needed When . . . Your healthcare provider will consider several factors when determining if antibiotics are needed for your child: age, severity of illness, diagnostic certainty, and follow-up options. Your healthcare provider may decide to wait a couple of days before prescribing antibiotics since you or your child may get better without them. Antibiotics Might Not Help if . . . When an ear infection is caused by a virus, antibiotic treatment will not help it get better. Ear infections will often get better on their own without antibiotic treatment. Your health care provider will determine what treatment is best for you or your child. Each time you or your child takes an antibiotic, the bacteria that normally live in your body (on the skin, in the intestine, in the mouth and nose, etc.) are more likely to become resistant to antibiotics. Common antibiotics cannot kill infections caused by these resistant germs. If symptoms continue to last for more than one month for OME or 2 days for AOM, you should schedule a follow-up appointment with your healthcare provider. Rest, over-the-counter medicines and other self-care methods may help you or your child feel better. For more information about symptomatic relief, talk to your health care provider or pharmacist. Remember, always use over-the-counter products as directed. Many over-the-counter products are not recommended for children younger than certain ages. How to Treat an Acute Middle Ear Infection? If your doctor isn't able to make a definite diagnosis of OM and your child does not have severe ear pain or a fever, your doctor might ask you to wait a day to see if the earache goes away. Sometimes ear pain isn't caused by infection, and some ear infections may get better without antibiotics. Using antibiotics cautiously and with good reason helps prevent the development of bacteria that become resistant to antibiotics. If your doctor prescribes an antibiotic, it is important to make sure your child takes it exactly as prescribed and for the full amount of time. Even though your child may seem better in a few days, the infection still has not completely cleared from the ear. Stopping the medicine too soon could allow the infection to come back. It is also important to return for your child's follow-up visit, so that the doctor can check if the infection is gone. Your child should start feeling better within a few days after visiting the doctor. If its been several days and your child still seems sick, call your doctor. Your child might need a different antibiotic. Once the infection clears, fluid may still remain in the middle ear but usually disappears within three to six weeks. To keep a middle ear infection from coming back, it helps to limit some of the factors that might put your child at risk, such as not being around people who smoke and not going to bed with a bottle. In spite of these precautions, some children may continue to have middle ear infections, sometimes as many as five or six a year. Your doctor may want to wait for several months to see if things get better on their own but, if the infections keep coming back and antibiotics aren't helping, many doctors will recommend a surgical procedure that places a small ventilation tube in the eardrum to improve air flow and prevent fluid backup in the middle ear. The most commonly used tubes stay in place for six to nine months and require follow-up visits until they fall out. If placement of the tubes still doesn't prevent infections, a doctor may consider removing the adenoids to prevent infection from spreading to the eustachian tubes. Currently, the best way to prevent ear infections is to reduce the risk factors associated with them. Here are some things you might want to do to lower your child's risk for ear infections. It's highly recommended you vaccinate your child with the 13-valent pneumococcal conjugate vaccine (PCV13). The PCV13 protects against more types of infection-causing bacteria than the previous vaccine, the PCV7. If your child already has begun PCV7 vaccination, consult your physician about how to transition to PCV13. The Centers for Disease Control and Prevention (CDC) recommends that children under age 2 be vaccinated, starting at 2 months of age. Studies have shown that vaccinated children get far fewer ear infections than children who are not vaccinated. The vaccine is strongly recommended for children in day-care. Do not allow sick children to spend time together. As much as possible, limit your child's exposure to other children when your child or your child's playmates are sick. Understanding the impact that ear infections have on a child's speech and language development is another important area of study. Creating more accurate methods to diagnose middle ear infections would help doctors prescribe more targeted treatments. Researchers also are evaluating drugs currently being used to treat ear infections, and developing new, more effective and easier ways to administer medicines.